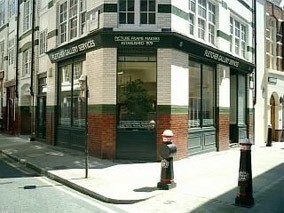 Fletcher Gallery Services was established by Robin Fletcher in 1979 and in 1980 moved into our former workshop at 3 Bartholomew Place next to our present premises in the City of London. We have been responsible for providing conservation quality picture frames ever since. Our speciality is in the area of framing contemporary works of art on paper for galleries, artists, businesses and private clients. In addition, we are able to frame almost all types of work. There are literally millions of combinations available to frame your artwork, so, for the best results, we recommend that you bring your artworks to our workshops where we can together discuss your requirements, give our advice based on over 40 years' experience and then provide you with an estimate from our unique picture framing software, "ArrowCalc". Our current lead time is about 10-15 working days. We are open from 9 am till 5.30 pm on weekdays. Appointments are not necessary but are recommended should you require a lengthy consultation. © 2019 Fletcher Gallery Services Ltd.